Billy E. Frye, a respected scholar, educator and administrator who helped guide Emory during years of rapid campus and program development as the university’s first provost, and later as interim president and then chancellor, died Nov. 14 near Clarkesville, Georgia. He was 84. During his 15-year tenure at Emory, Frye was recognized as a steady, influential leader who demonstrated integrity, intelligence and deep moral stamina, with a gift for bringing humor and grace to even the most challenging deliberations. Born in Clarkesville, Georgia, near the North Carolina border, Frye earned his bachelor’s degree from Piedmont College before coming to Emory for graduate school, receiving one of the biology department’s first doctorates. He joined the faculty of the University of Virginia, then began a 25-year career at the University of Michigan, where he arrived as an assistant professor of zoology and departed as vice president for academic affairs and the school’s first provost. Frye arrived as Emory was engaged in unprecedented growth and expansion — only a few years earlier, Robert W. Woodruff, legendary leader of the Coca-Cola Company, and his brother George Woodruff had given Emory a then-record gift of $105 million. With one gift, Emory’s endowment increased by 60 percent, fueling new faculty hires and the creation of endowed faculty chairs, and the growth of academic programs and building construction. As provost, Frye was influential in leading a campus-wide self-examination that led to the 1996 publication of Choices & Responsibility: Shaping Emory’s Future, a seminal document that outlined guiding principles for the university’s future. At the time, the strategic planning trend at universities typically involved creating a wish list of thousands of items, recalls Susan Frost, former vice president of strategic development, who worked closely on strategic planning in the provost’s office and helped on the project. “Many universities were doing things that were quantitative, but Billy’s idea was more about the heart of the institution, really promoting the importance of the voice of the faculty,” says Frost, now a private higher-education consultant. The point was to discover “what the faculty wanted to see the university invest in, not only in programs, but in their own influence in the institution,” she says. Upon his retirement in 2001, Frye cited Choices & Responsibility as one of his most important accomplishments. “It’s the faculty’s legacy,” he explained in an Emory Report interview. 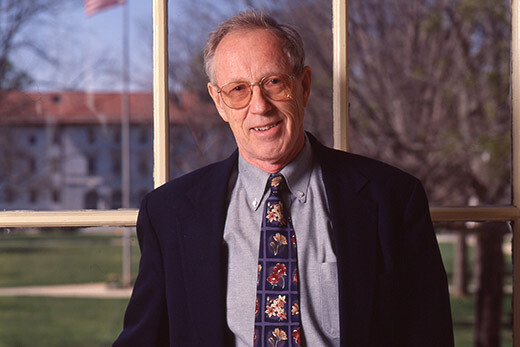 During the 1980s and 1990s, Frye was recognized as a national spokesperson and leader in preparing research libraries for the future by bringing attention to issues such as book preservation and digitization and the need for national collaboration among research libraries. “He was so influential in talking about the loss of scholarly memory if we didn’t take steps to preserve library collections around the country,” says Deanna Marcum, former president of the Washington D.C.-based Council on Library and Information Resources (CLIR). Frye’s leadership in that crusade was recognized when the Frye Institute was named in his honor. Created through support from the Robert W. Woodruff Foundation, the institute was sponsored by Emory, EDUCAUSE and CLIR to develop within participants leadership skills necessary to integrate libraries and information technology in ways that would benefit higher education. Based at Emory for 10 years, the institute brought together mid-career librarians and IT administrators from all over the world, including Africa, Europe, the Middle East, New Zealand and Australia. “Its reach was significant,” says Ginger Hicks Smith, retired director of campus and community relations for Emory University libraries. Frye’s support was also felt in the growth of Emory’s acclaimed African American collections, now part of the Stuart A. Rose Manuscript, Archives and Rare Book Library. When a group of faculty and alumni endorsed building African American archives to support teaching and a growing graduate program, Frye provided funding for a curator, recalls Linda Matthews, former director of Emory special collections and former director of libraries. After Laney left Emory in 1993 to become U.S. ambassador to South Korea, Frye served as interim president, then continued as provost once President William M. Chace took office in 1994. He then served as chancellor from 1997 to 2001. “While I respect and honor many, many colleagues at Emory, he has to be one of the best — one of the finest men I’ve ever met,” he adds. Raised on a farm in the North Georgia mountains, Frye never lost a sense of humility and ability to connect with people, reflects Harriet M. King, who worked in his office as a senior vice provost of academic affairs. “Physically, he was a large man — probably 6’2” — a big North Georgia country boy at heart who came to the city and fit in,” she recalls. Frye was an early champion of the roles of technology and interdisciplinarity within the academy, she notes. “He believed it was the way of the future, that sharing tools for understanding and using information from other disciplines enables each of us to explore our own disciplines with fresh eyes,” King says. Outside of academic life, Frye was a master at growing both orchids and roses, volunteering his time and expertise with the Atlanta Botanical Garden and Atlanta Orchid Society. A campus memorial service is planned for spring 2018, with details to be announced.